Behavioral issues can impact a child's entire life. A behavior assessment allows concerned adults to find the reasons behind problem behaviors. It may also be used to find strategies that will help address the behaviors in meaningful ways. 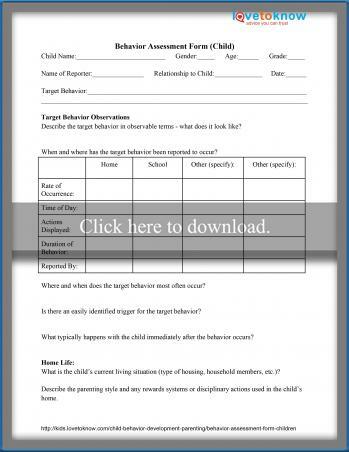 The Behavior Assessment Form presented here can be used to collect data about most any child behavior issue. To download the form, simply click on the image. Once the document is opened you will have the option to print it. If you are having trouble opening the form the Guide to Adobe Printables may be helpful. The form can also be completed by one reporter who observes the child in different locations and speaks with relevant adults. It is recommended that the form only be used to focus on one specific behavior. If there are multiple behavioral concerns, you would use a new form for each target behavior. If you have multiple children, evaluation forms should be printed individually for each child. What Is a Behavior Assessment Form? Scatter plot - This uses a grid to document frequency of behavior across time. Interview - Any adults who spend a significant amount of time with the child answer questions about the child's behavior. Self-evaluation - The child answers questions and gives insights about his behavior and insights. ABC data collection - Direct observations of the Antecedent, Behavior, and Consequences are recorded. Behavior assessment systems for children should be personalized to suit the needs of each child. Utilizing multiple sources and types of assessments will give you the most accurate image of the target behavior. Once a problematic behavior has been reported, you can begin to collect data from the child along with her home and school. It is important to involve children in decision-making, but you must take care to treat the child with respect and view the assessment in a positive light. Why Use a Form to Assess Behavior? A form helps identify factors affecting behavior that my not be obvious. A form can be completed discreetly. These types of forms help identify causes of behavior. It provides concrete data to use when creating an intervention plan. Behavior assessment forms are easy to use and serve as a non-intrusive way to gather information about a child. Children display a variety of behaviors in different settings that may be problematic. These behaviors are often an inefficient way for children to communicate their needs or wants. A behavior assessment form can help to identify why a child is behaving in a specific way which will help in creating a plan to improve behavior.